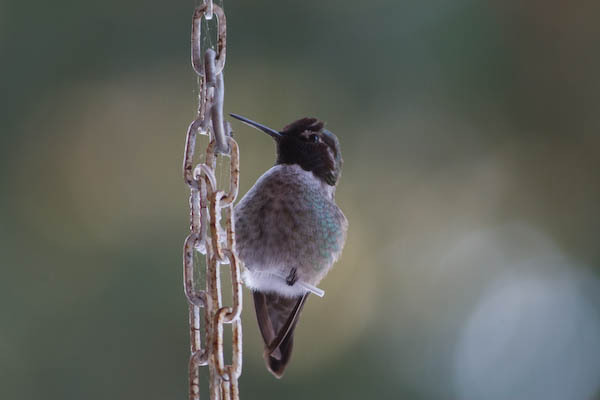 In our area, Anna's Hummingbirds are year-round residents. This is a story from November 22-24, 2010, during an unusually cold period. 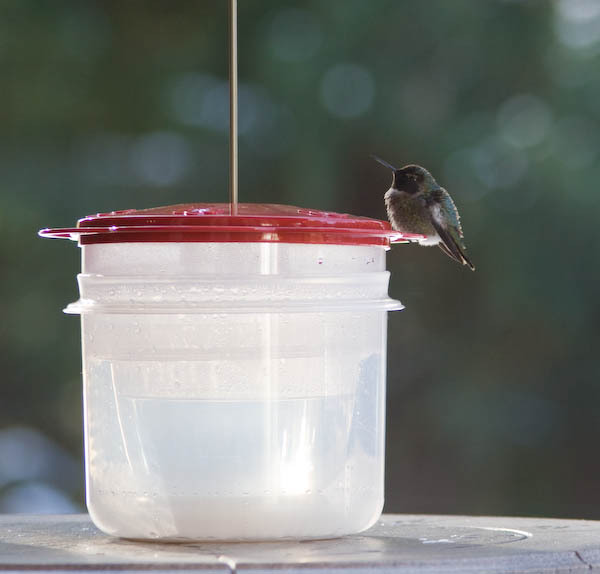 On Monday, we noticed that there was a hummingbird camped out on our feeder. 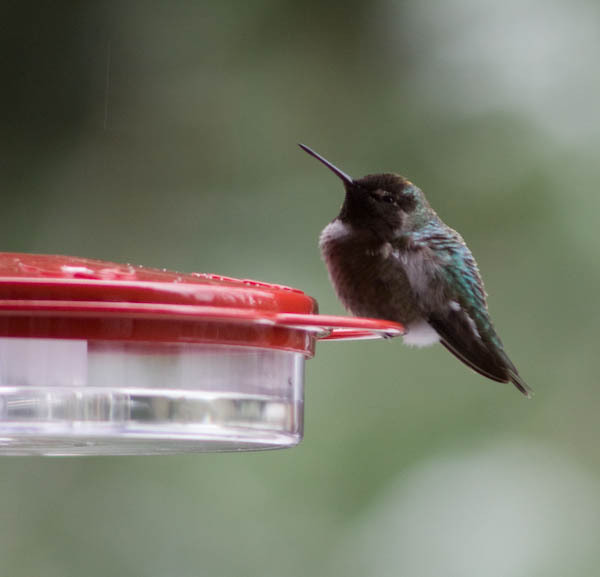 Normally, hummingbirds buzz in, drink for a few seconds, and fly off. This one sat there the whole time we were eating breakfast, again during lunch, and every time we checked throughout the day. He would occasionally drink, but mostly was keeping an unwavering watch over his territory. When another hummer approached, there was much twittering and buzzing of wings, and he'd chase it away, usually returning promptly to resume his perch. We dubbed him Alpha. 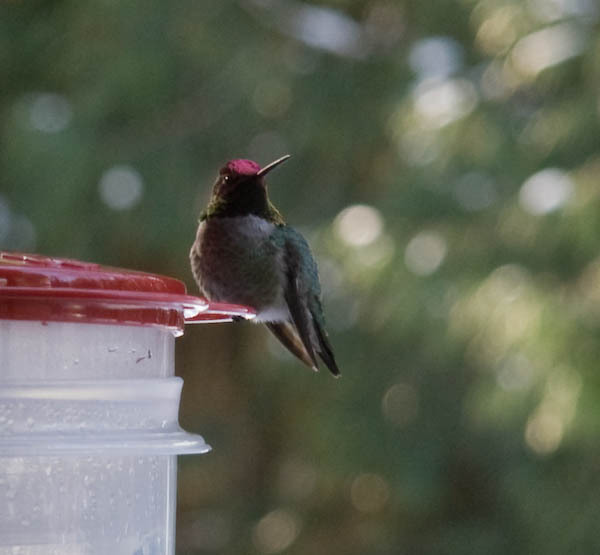 We're not sure how many other hummers we have as regulars at the feeder, but there's clearly at least one other than Alpha who has an opportunity to drink periodically. He's got a different body shape and the red on his neck has a distinct shape. His lower rank in the pecking order is apparent by the fact that he generally comes, drinks hurriedly with frequent nervous checks of the area, and then zips away; no loitering on the feeder. We've been calling him Beta. 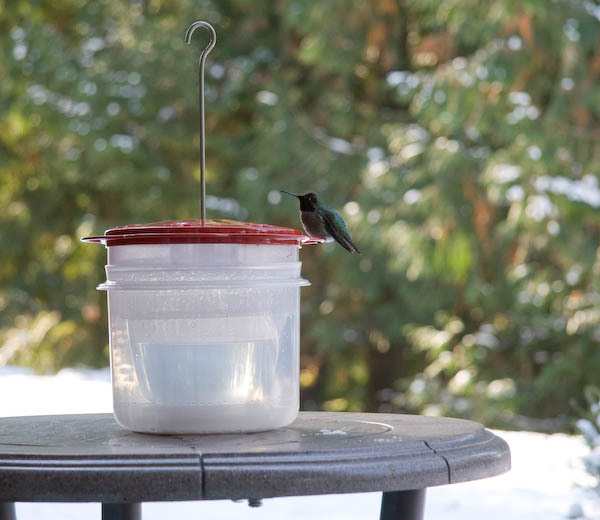 By Tuesday, it had become (and remained) cold enough that the sugar-water in the feeder had frozen solid. 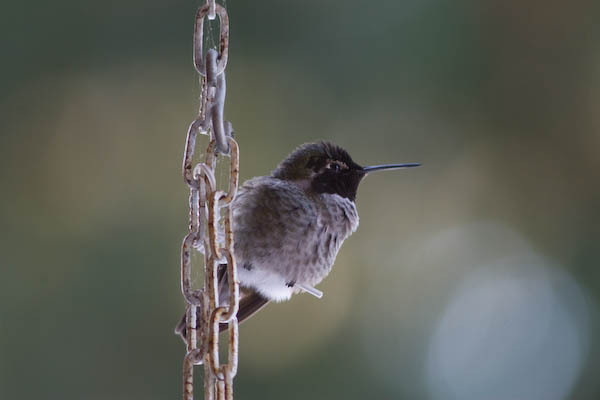 Tom observed one poor hummer trying to drink, attacking the ice-mass woodpecker-style. We decided to thaw it and concocted a setup that we hoped would take care of that without necessitating removing the feeder from the backyard. We put a small container of steaming water inside another container, then nested the feeder on top of the larger container, sealing the steam inside, sort of like a double-boiler. When Cathy went out to take the feeder off the hook, Alpha was of course sitting on his perch. He chittered a bit, then flew away when Cathy wasn't chased away by his scolding. 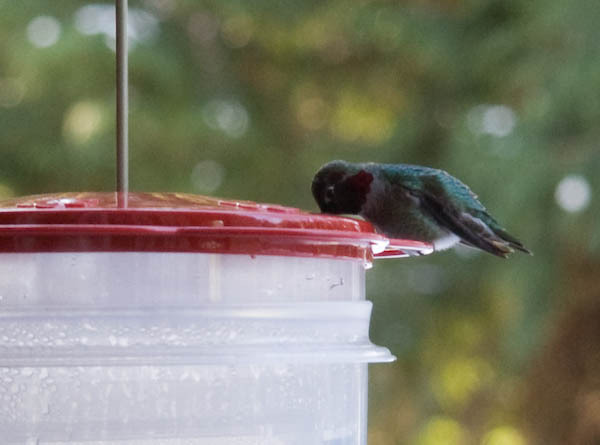 We moved a small patio table over to the area where the feeder hangs, hoping that placing the stack of containers and feeder on the table would be close enough to the original location that it wouldn't be too disruptive to the hummers. Interestingly, Beta was the first to return from the trauma of a human interfering with the feeder. It was under five minutes, and he didn't seem at all phased by the new location. After a while on the chain, and some more time at the tip of a high branch of a nearby tree, Alpha finally came down to the feeder. He drank a bit, then resumed his usual camping out. Tuesday evening, we brought the feeder in after dark (and several checks to make sure Alpha wasn't sleeping there!) to thaw overnight. Wednesday morning, Tom got out of bed around 7 a.m. to put the feeder back outside. 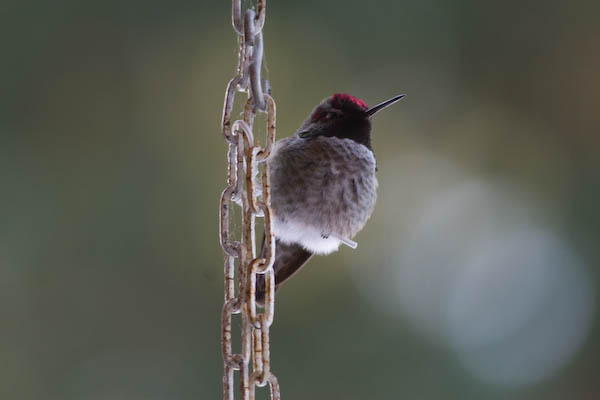 It was still pre-dawn, but there was already a hummingbird buzzing around the feeder area when Tom looked out in the faint morning light. 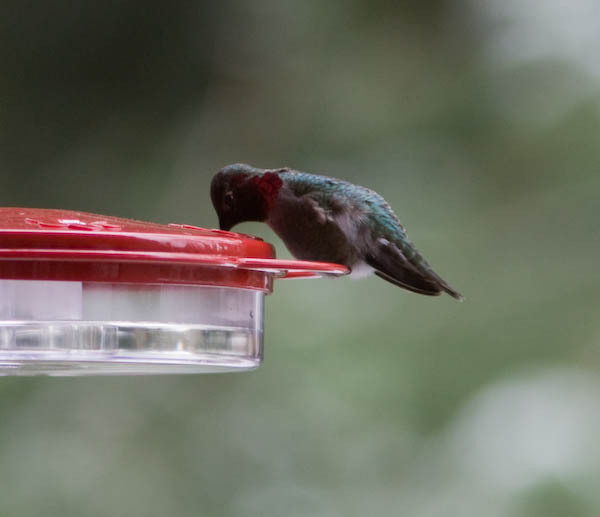 Several minutes after he hung the feeder, we had a hummer happily drinking away. By 8:30, the sugar-water in the feeder was starting to form ice, so we put out the steam-bath contraption.